Eurasian watermilfoil is a submerged, rooted, dicotyledonous, aquatic plant that can grow to a length of over seven meters long (Gleason and Cronquist 1991, Chadde 2002, Reznicek and Voss 2012). It branches profusely once it reaches the surface and forms a dense canopy (Aiken et al. 1979). EWM is monoecious with seven pink flowers on 5-20 cm (no more than 50 cm) long spikes that extend above the water surface(Smith 1990) The upper flowers are typically male while the lower flowers are female. The spherical fruits produced by sexual reproduction are 2.3 mm long with 4 grooves. Each fruit contains 4 seeds(Jacobs 2009). EWM has four, 1.5 to 4 cm long leaves per node in a whorled arrangement. Each leaf has 12 to 24 filiform (threadlike) divisions giving the leaves a feathery appearance(Aiken et al. 1979). EWM self prunes as the canopy biomass shades the lower leaves, therefore the lower stems of the plants are leafless (Adams et al. 1974, Titus and Adams 1979). Roots are not essential for survival, and EWM has a very low root to shoot ratio (0.01-0.15); however, the plants grow best if they have roots allowing the plant access to nutrient pools in the sediment (Grace 1978). 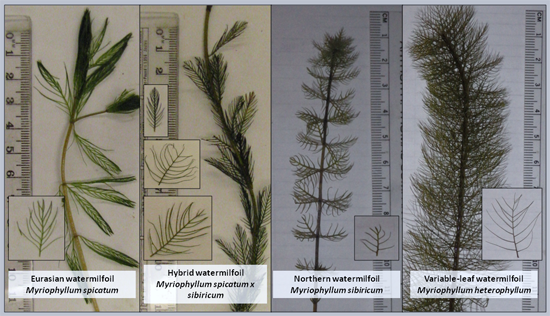 EWM can be distinguished from northern watermilfoil, Myriophyllum sibiricum, by its leaf morphology and absence of turions. 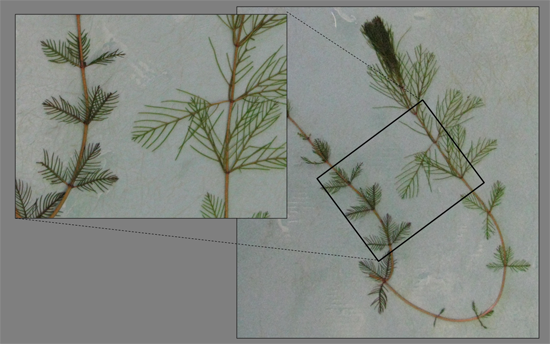 Northern watermilfoil has fewer leaf divisions than EWM and has turions. When held out of the water, EWM leaves relax and fall against the stem while the natives? leaves remain rigid. Northern watermilfoil sparsely branches whereas EWM plants have stems with many branches. EWM also have stems doubled in width immediately below the inflorescence. Although it was disputed (Love 1961), EWM was reported have hybridized with northern watermilfoil as early as 1954 (Patten 1954). It has since been confirmed that EWM readily hybridizes with northern watermilfoil, resulting in progeny with indeterminate morphology (Figures 3 & 4). Because of hybridization, genetic analysis is way to confidently confirm identification.??? Figure 3. Watermilfoil of the Keweenaw waterway. Identification was confirmed using genetic techniques (Photo: K. Juneau). Figure 4. Indeterminate? 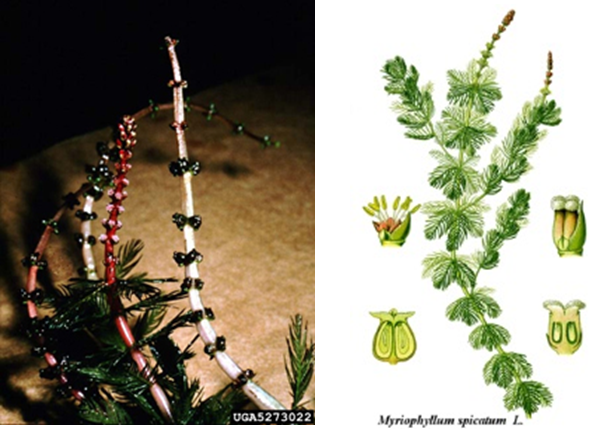 morphology of a hybrid watermilfoil plant. This single hybrid stem has leaf characteristics similar to both Eurasian and northern watermilfoils. Genetic identification is the only sure way to differentiate these watermilfoils (Photo: K. Juneau). 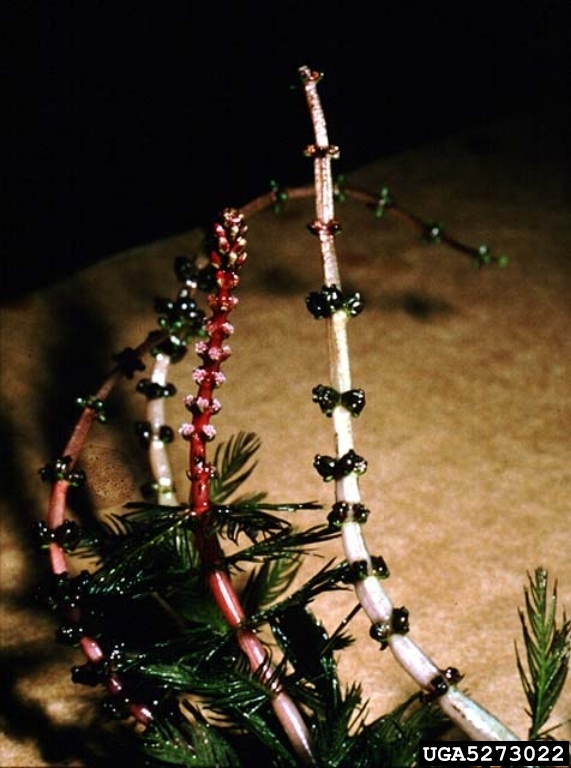 EWM breaks dormancy and begins growing shoots from the root crowns when water temperatures begin increasing and approaching 15?C (Smith 1990). It has been shown to start growing as early as January in southern states, but usually occurs between March and May in the Great Lakes region (Grace 1978). EWM can be established by April, well before other macrophytes show growth (Grace 1978). In the Great Lakes region, flowering can occurs in June when the plant reaches the surface of the water (Smith and Barko 1990). In southern states, EWM can flower a second time in Late July to early October (Nichols 1975, Kimbel 1982, Martin and Valentine 2014). Fruits are set in June (later in July or August in higher latitudes), and EWM continues fruiting until September. The biomass maxima, the period where individual plants have the greatest amount of biomass during the growing season, occurs shortly after the plants flower (Grace 1978). After the plants flower and fruit, leaves begin to slough off the stems and autofragmentation occurs. Autofragmentations allows EWM to break into many fragments to induce vegetative propagation. In latitudes with longer growing seasons, EWM will undergo two periods of autofragmentation following each flowering episode (Grace 1978). In northern latitudes, the aboveground tissue typically dies back to the root crowns in the late fall then overwinter as young shoots or buds located on the root crown or as submerged fragments and seeds in the sediment (Grace 1978). However, EWM can also be found in the leafy-green condition under ice (Nichols and Shaw 1986). ?In warmer climates, where the water remains greater than 10?C, EWM will overwinter in an evergreen form showing little dieback (Aiken et al. 1979). EWM is capable of sexual reproduction, which occurs in June once the inflorescence grows above the surface of the water (Nichols 1975, Smith and Barko 1990). In southern latitudes with longer growing seasons or in shallow waters where individuals reach the surface early in the growing season, EWM can flower twice (Kimbel 1982, Martin and Valentine 2014). The female flowers on an individual will open first followed by the male flowers at a later date (Aiken et al. 1979). This strategy favors cross pollination between plants to increase genetic diversity within the populations (Lloyd and Webb 1986). EWM is primarily wind pollinated (Haynes 1988, Madsen and Boylen 1989); however, there is evidence that insects can also play a role in pollination (Aiken et al. 1979). Once the eggs are pollinated, the ovaries will mature into fruits that contain four seeds each. An inflorescence typically produces 12-40 seeds, although EWM has been shown to produce up to 112 seeds per stem (Grace 1978, Madsen 1988). The fruits float for hours to days and will be dispersed through wind and water currents before they sink (Nichols 1975). Seeds have a long dormancy, up to 7 years. In order for a seed to germinate, a plug sealing the micropyle (a small opening into the seed) must be dislodged or the endocarp (inner layer of the fruit) must be ruptured. Dormancy can be broken through scarification, freezing, drying, or extreme pH (Coble and Vance 1987, Madsen and Boylen 1989). There is also evidence that EWM seeds may require after-ripening (Grace 1978). Seeds produced during the summer will most likely not germinate until the following spring (Patten Jr 1955). In the lab, germination rates can be up to 97% (Coble and Vance 1987, Madsen and Boylen 1989). 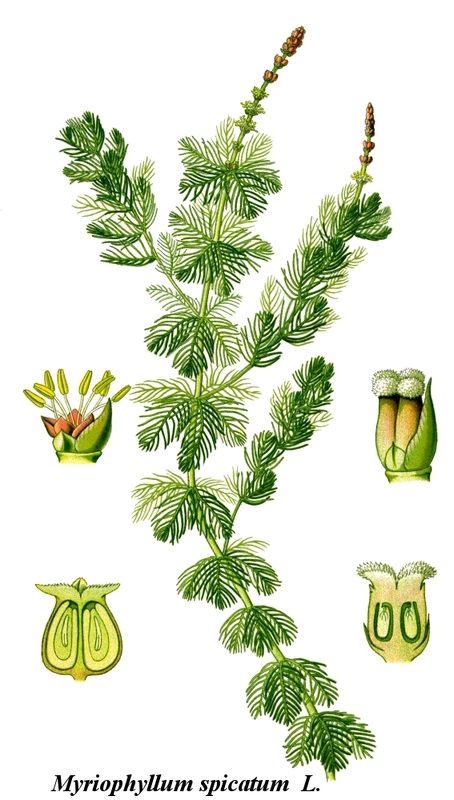 Seedlings are thought to be rare, so it is unknown the role sexual reproduction plays toward the success of EWM (Martin and Valentine 2014); however, sexual reproduction is responsible for the production of hybrid (myriophyllum spicatum ? ?sibiricum) watermilfoil. Hybridization was first reported in 1954 and hybrids have since been detected throughout the range of EWM (Patten 1954). EWM is well known to reproduce asexually through fragmentation. The plant will autofragment as well as through natural and human caused disturbances. After EWM flowers, individuals begin to produce layers of lignified cells at stem nodes allowing it to fragment without mechanical disturbance. Roots grow at the nodes and the fragments later sink and establish roots into the substrate. Fragments as short as 10 to 20 cm grow into new individuals.? In addition to autofragmentation, disturbances such as wave action, ice scour, wind, waterfowl activity, and human activity can fragment EWM. These fragments are also capable of growing roots and developing into individuals. EWM has specialized airspaces in the tissue (lacunae) allowing the plant to float (Grace 1978). This allows fragments to be spread within a waterbody by wind and water currents before sinking. Boaters and waterfowl readily move fragments between water bodies, which is a major reason underlying its rapid spread across the United States. Axillary buds can also detach from the root crowns at the end of winter to form new plants (Aiken et al. 1979). EWM uses the C3 carbon fixation metabolic pathway, but it has a low photosynthetic compensation point (where photosynthesis rates equal respiration rates), a high temperature optimum for net photosynthesis (30-35?C), and some anatomy similar to C4 plants (Stanley and Naylor 1972, Grace 1978, Aiken et al. 1979). All these characteristics allow the plant to grow well in areas with soft water and low concentrations of dissolved inorganic carbon (Grace 1978). Free carbon in the water column is preferred by EWM, but in alkaline water where free carbon limits the growth of other aquatic plants, bicarbonate becomes an important source of carbon (Van et al. 1976, Titus 1977, Smart and Barko 1986). Having a low photosynthetic compensation point also allows EWM to also grow in deeper waters where only 1-2% of the surface light reaches (Grace 1978). In areas with low light, EWM allocates energy to shoot elongation and canopy formation to increase the surface area of the photosynthetic tissue (Barko and Smart 1981). Up to 68% of EWM?s biomass can be within 30 cm of the water surface creating a dense canopy (Titus and Adams 1979). EWM also self-prunes its lower leaves to reduce the metabolic requirements of maintaining the leaves in lower light conditions (Titus and Adams 1979). Like most aquatic plants, EWM has reduced xylem, since water and nutrients are able to be taken in through leaf tissue (Hartman and Brown 1967). The leaf surfaces have specialized cells, hydropoten, that are responsible for absorption of nutrients in the water column (Grace 1978). EWM does have developed phloem allowing the transport of nutrients and photosynthate throughout the plant. In fact, nutrients absorbed by the roots can be transferred upward within 15 minutes (Grace 1978). PO4 and N in the form of ammonium are taken up by the roots from the sediment, while ammonium and nitrate can be absorbed from the water column (Nichols and Keeney 1976, Barko and Smart 1980). Na, Rb, Cl, Fe, and Ca are also able to be absorbed by EWM via either the roots or leaves (Grace 1978). Foliar uptake of nutrients is important in eutrophic waterbodies; however, EWM?s ability to utilize nutrients in the sediment provides an advantage over plants that are not able to use that pool of resources, especially in oligotrophic lakes (Grace 1978).? N and P are often thought to be the limiting resources for EWM; however, EWM has low requirements for these nutrients (critical tissue concentrations of N = 0.75% and P = 0.07%) (Gerloff 1975, Mickle 1975), so it may be the case that other nutrients are more limiting. K, for example, is likely to be an important limiting resource because the critical tissue concentration of K in EWM is 0.35% (Grace 1978). Ca can also explain some of EWMs distribution, suggesting that it may be limiting in certain environments (Hutchinson 1970, Grace 1978). Approximately 43% of the EWM volume is comprised of specialized structures called lacunae (Hartman and Brown 1967). These structures are specialized air spaces that allow the plant to float and also help make gas utilization more efficient. When the plant goes dormant for the winter, the carbohydrates are stored in the roots and persistent stems. There is no specialized structure for carbohydrate storage (Titus and Adams 1979, Perkins and Sytsma 1987, Smith 1990). EWM is thought to be allelopathic. Allelopathic plants produce and secrete chemicals that influence the growth and survival of other organisms (Rice 1984). Extracts from EWM contain polyphenols that have been shown to inhibit the growth of cyanobacteria, green algae, and duckweed (Planas 1981, Elakovich and Wooten 1989). EWM extracts have also been shown to delay the development of mosquito larvae, and that high concentrations of the extract are lethal to them (Dhillon et al. 1982). The allelopathic polyphenols have been identified as ellagic, gallic, and pyrogallic acids, and catechin (Nakai 2000) and tellimagrandin II (Gross et al. 1996). The production of tellimagrandin II, a compound that inhibits and deactivates algal extracellular enzymes, increases when EWM is grown in nitrogen limiting conditions (Gross et al. 1996, Gross 1999). Glomski et al (2002), however, suggests that if EWM does secrete allelopathic chemicals into the water column they may be degraded quickly by microbes (Gross 1999) or quickly diluted (Morris et al. 2009), thus providing no competitive advantage over other organisms (Glomski et al. 2002). The production of these compounds in EWM could be for defense against herbivory, rather than for allelopathy (Ervin and Wetzel 2003). EWM can be found throughout the United States because it is able to thrive in a wide range of environmental conditions in lakes, ponds, connecting waters, and streams provided they are low energy environments (i.e., slow flowing waters with little wave action). EWM is typically found in waters between 1 and 3 m deep, but it can grow in waters up to 10 m deep (Environment 1981, Smith 1990). In very clear waters, hydrostatic pressure limits the depth at which EWM grows (Ferling 1957, Golubic 1963, Grace 1978). When EWM grows in clear, deep waters, it often will not reach the surface or form a dense canopy (Madsen and Boylen 1989). Turbid water can also restrict EWM to shallow depths in lakes (Titus and Adams 1979). Wave action, ice cover and scour, and seasonal variations of water levels limit EWM to waters deeper than 1 m. Epiphytic growth can also restrict EWM to waters deeper than 1 m, where light may limit photosynthesis by the epiphytes (Phillips et al. 1978). EWM grows best in fine textured inorganic sediment of intermediate density (0.8 to 1 g/ml)(Barko et al. 1986). It produces the most biomass in substrates that are 11-26% sand with organic matter between 5-14%(Nichols 1975). EWM does not grow well on course substrate which has a lower cation exchange capacity and holds a lower concentration of nutrients. 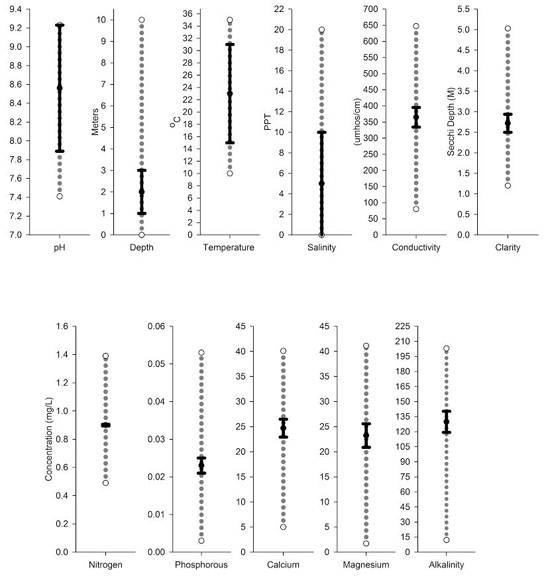 EWM grows poorly on sediment with greater than 20% organic matter(Barko et al. 1986, Smith 1990). The optimum photosynthetic temperature of EWM is 33.6?C (Titus and Adams 1979); however, EWM grows well at temperatures between 15 and 35?C (Smith 1990). The plant is cold tolerant and begins photosynthesizing when water temperatures reach 10?C in the spring (Stanley and Naylor 1972). Its ability to photosynthesize at low temperatures allows it to grow earlier than other aquatic plants in the spring and also gives it a large North American distribution. Testing for alkalinity is useful when predicting waterbodies that are at risk of EWM invasion. EWM has an affinity for and grows best in alkaline lakes with high inorganic carbon concentration (Nichols 1975, Smith 1990). EWM does have a large pH tolerance range and in the laboratory can grow in water with pH between 5.4 and 11, but EWM is typically found in lakes with pH between 7.41 and 9.23 (Smith 1990). EWM can tolerate salinity and is able to survive where salt concentrations are up to 20 ppt, but it grows best at concentrations lower than 10 ppt (Martin and Valentine 2012). It has been shown that there is no significant impact on EWM biomass when it?s grown at salinities of 15 ppt; however, salinities at this level inhibit flowering and root growth (Martin and Valentine 2014). 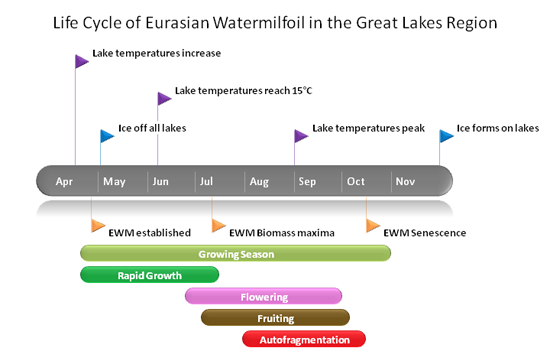 EWM grows well in lakes with high nutrient concentrations, and heavy EWM growth is an indicator of eutrophic conditions(Jacobs 2009), but because of EWM?s biology and its ability to assimilate nutrients from sediment it can tolerate oligotrophic waters. This plant can grow in lakes with P levels as low as 3 ug/l (Smith and Barko 1990). In oligotrophic lakes, EWM may be restricted to areas with nutrient rich sediment could have a patchy distribution and in cases of extreme nutrient limitation, EWM will not compete well with slow growing, nutrient conservative species, such as the quillworts (isoetids) (Jones et al. 1983, Smith and Barko 1990). Figure 6. Ranges of water characteristics conducive to EWM growth. Black, solid lines represent conditions in which EWM is most often found, Gray, dotted lines represent the conditions EWM can tolerate. Data from Canny 2007(Canny 2007), Martin and Valentine 2012, 2014 and Smith and Barko 1990(Smith 1990).